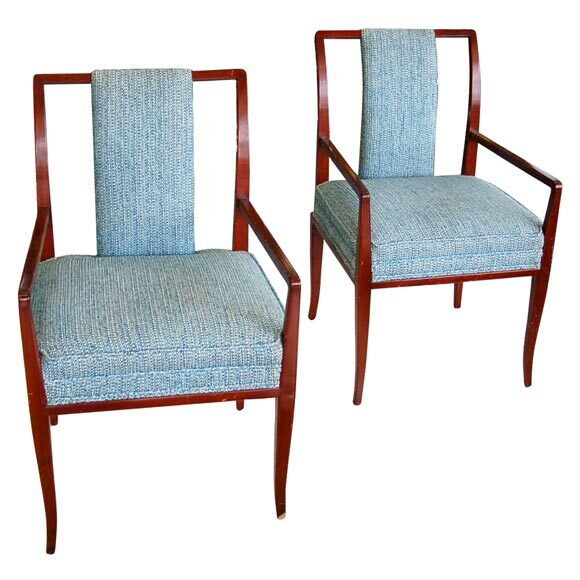 These French 1930's armchairs, available through Coconut Company, are so elegant yet not at all cold or fussy. 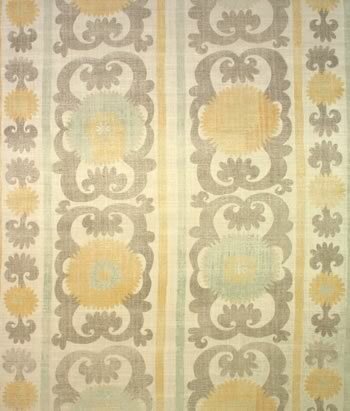 I was browsing through the newer designs from Bennison and came across two I wanted to share: Songbird, top, in aqua/yellow on linen, and Magnolia, bottom, in blue/green on fine oyster linen. 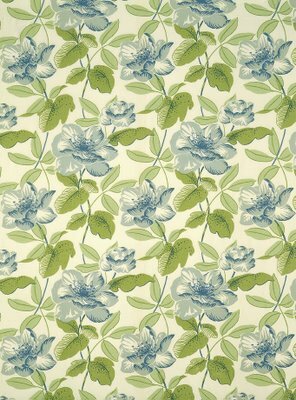 To me, either pattern would be amazing upholstered on the walls of some sort of lady-like dressing room or walk-in-closet. The room below, designed by Schuyler Samperton and Anna Hackathorn, is what I have in mind. (And yes, I may have posted this room once before. I love it!) 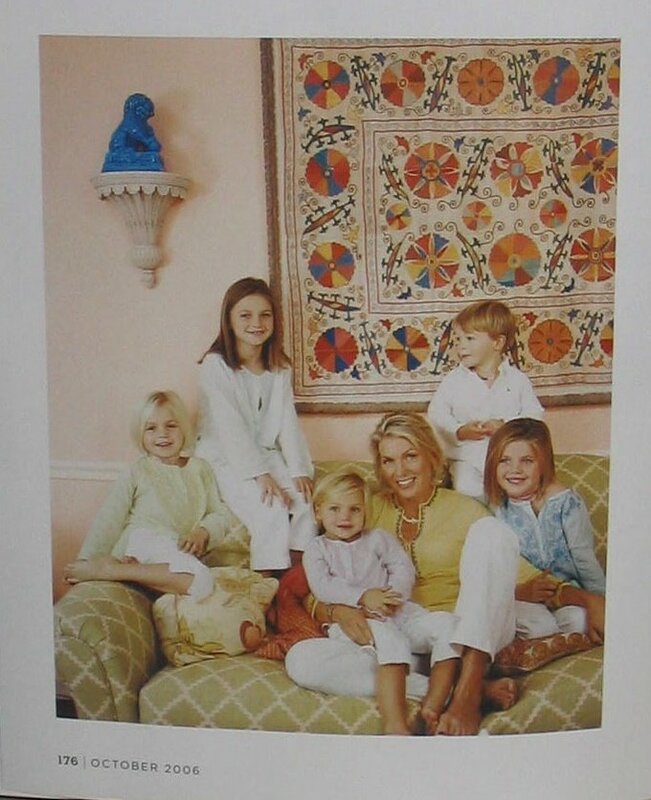 Originally it appeared in InStyle spring 2005. Rebecca Vizard, a designer and textile collector based in St. Joseph, Louisiana, recently posted her 2006 assortment of small Christmas stockings. 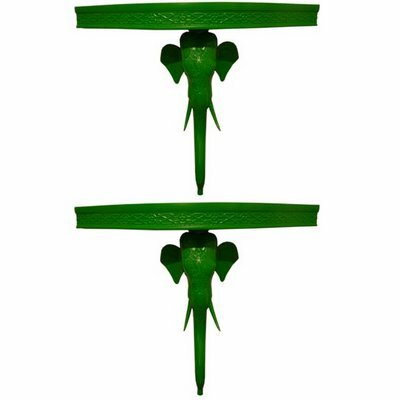 The stockings are about six to seven inches long and made from fragments of lavish antique textiles. 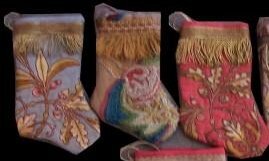 Vizard also offers stockings made from vintage Fortuny. 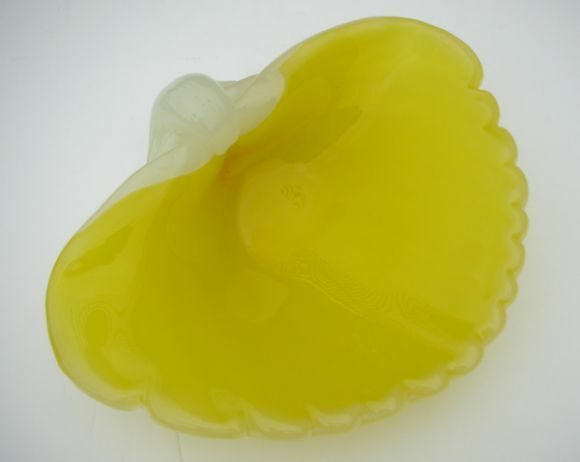 Prices range from $35-$75. BTW: I've found these to be the perfect size for holding gift certificates, large chocolate bars, secret messages for kids, and tiny gifts. They are actually very versatile. At first glance, the pattern on this pillow looked to me like a fun, wild psychedelic print from the late 1960's. 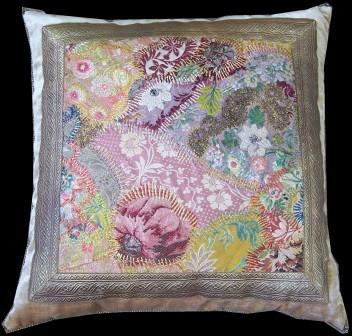 But actually the pillow, designed by Rebecca Vizard, is made from a 19th-century crazy quilt fragment. Crazy quilts are, as the name implies, quilts patched together in a random style. Resourceful women who needed to save every scrap of fabric were the first to make quilts this way. 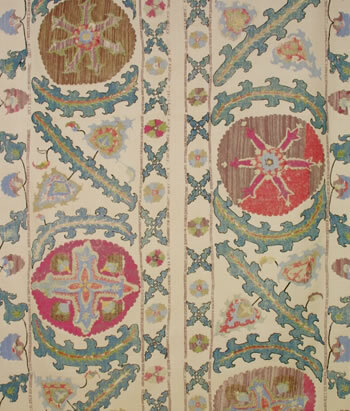 Later though, during the mid-19th-century, this haphazard patchwork technique became very chic. Victorian women used irregular pieces of silk, satin and velvet, combined with elaborate embroidery, to create ornamental throws. 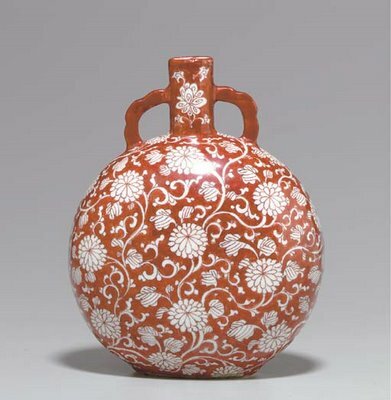 At the same time, Japanese art, which celebrates asymmetry and imperfection, was in vogue in America. So, many art historians see an Asian influence in the Victorian crazy quilts. Regular readers know that I post often about Central Asian suzanis. So of course I couldn't resist sharing this fresh living room, above, designed by Timothy Whealon and featured in the October Domino. A large suzani on the wall serves as the room's focal point and looks great juxtaposed with that sofa covered in Lulu DK's Chant. There are other Eastern inspired patterns around the room too, interpreted in old school Sister Parish sorbet colors, in fabrics from John Robshaw, Lulu DK and Raoul Textiles, and Brunschwig & Fils. 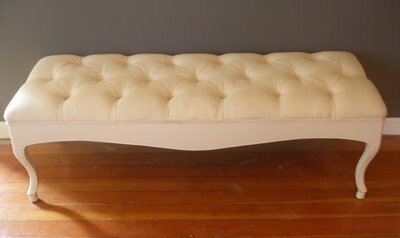 Whealon's addition of the white leather Moroccan poufs, shown below, is such a fun touch. Below are images of British decorator Robert Kime's hand-printed fabrics that are inspired by his travels through Asia, Turkey, Egypt and other Eastern locals. 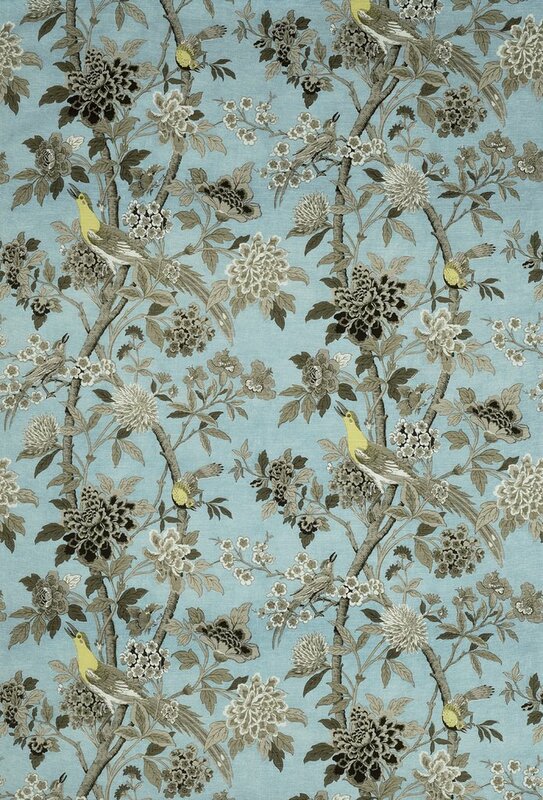 I'm a big fan of his work, and although in the U.S. his fabrics are only available to the trade or through select boutiques, I wanted to share these images with everyone who loves beautiful textiles. 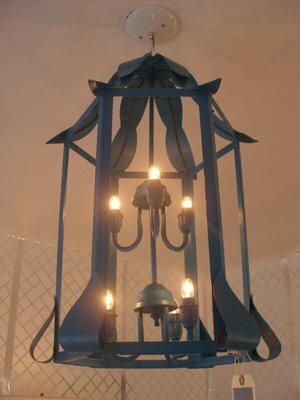 A large sampling of Kime's designs can be viewed on his site. 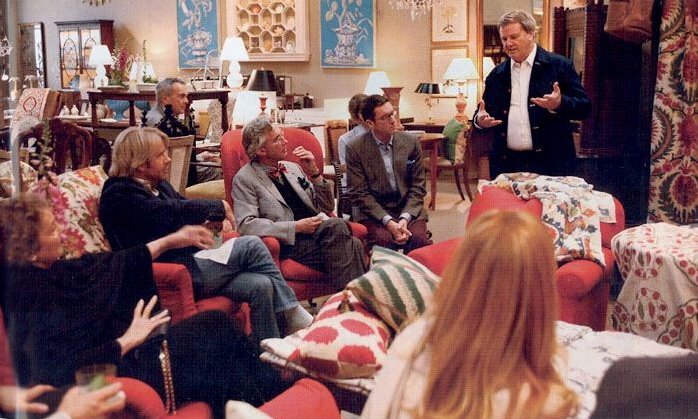 The last image above (via Hollyhock) shows Kime standing, presenting new designs to a group of designers including Tim Clarke. 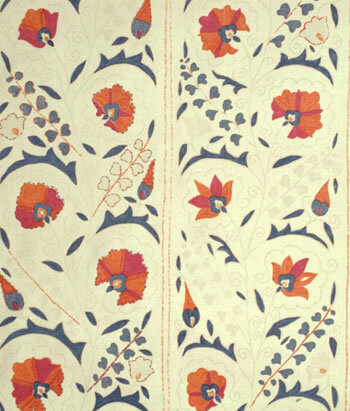 For more on suzanis, visit the Flower Power exhibition site at Textile Art, or see my earlier posts, Doris Duke Suzani Collection and Suzani Mania. 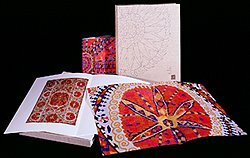 Shown above is an amazing publication, The Great Embroideries of Bukhara, created in conjunction with the exhibit Flower Power. 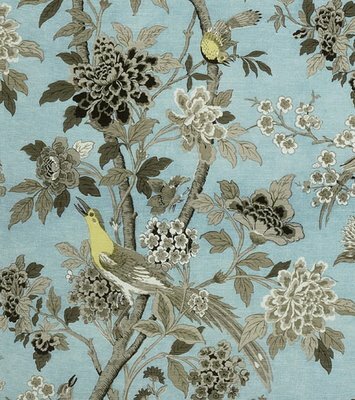 It is available through Textile Art, and is near the top of my wish list. 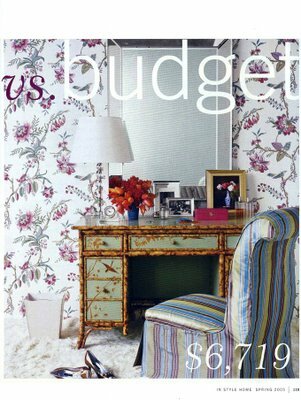 You've probably heard the news that Victoria Hagan, an interior designer known for her highly sophisticated, cerebral approach, recently created a home furnishings line for Target. In fact, the October issue of Elle Decor includes a nice feature on Hagan's collection. And I'm quite impressed. The look is so refined and timeless. 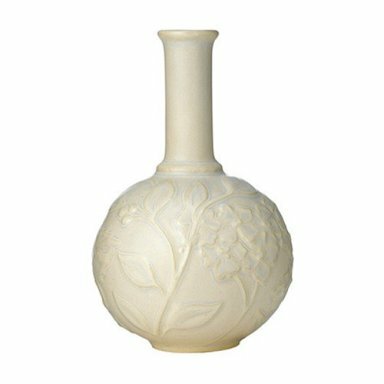 Decorators often say they combine budget finds with expensive antiques, and I think the two ceramic bud vases above (only $7.99 each!) would be perfect for that type of mix. 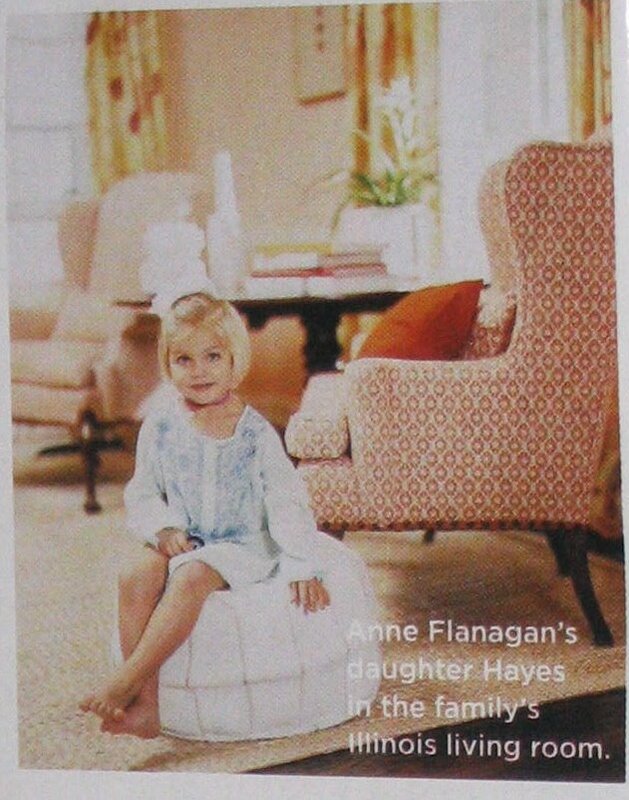 Hagan's pillows and mirrors are worth a look as well. Congrats to interior designer Vanessa De Vargas for being featured on Daily Candy L.A.! A fan of Vanessa's work, in the past I've posted samples of her revamped vintage furniture, sold through her Venice, California showroom Turquoise. Above are some of her latest pieces that I'm loving. 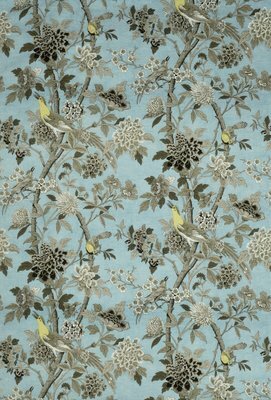 British decorator Robert Kime designs hand-printed fabrics that are often inspired by his travels through central Asia, Turkey, Egypt and other Eastern locals. 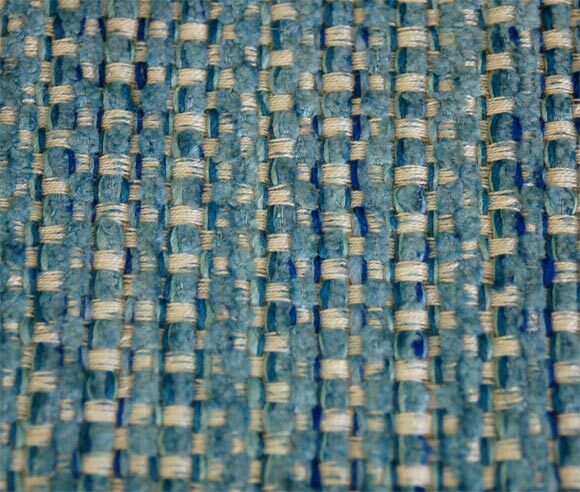 I'm a big fan of his work, and although in the U.S. his fabrics are only available to the trade or through select boutiques, I wanted to share these images with everyone who loves beautiful textiles. A large sampling of Kime's designs can be viewed on his site. 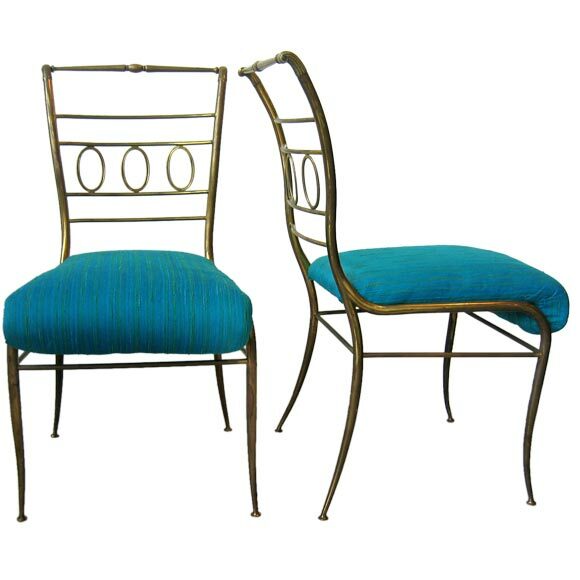 Look at the restrained curves on these 1940's Italian brass side chairs, above. 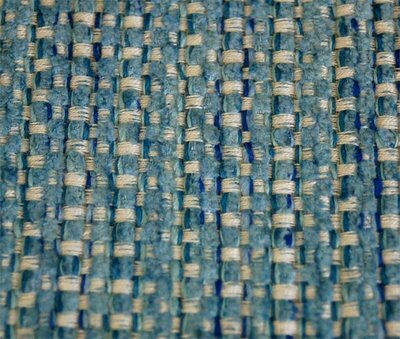 That turquoise silk upholstery is original. 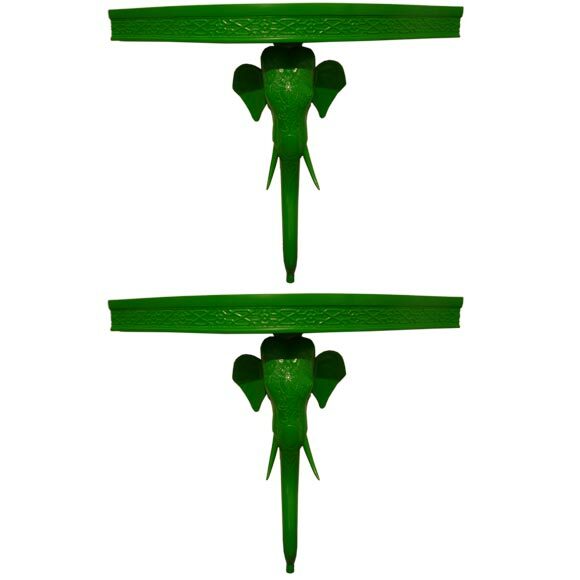 Available through Modest Designs. The pair of 1960's armchairs, above, designed by Tommy Parzinger with original upholstery is available through Collins And McCullough. 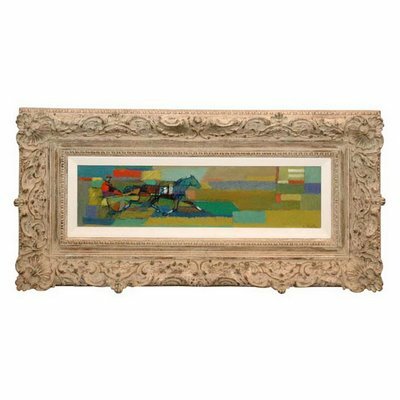 A French 1950's painting, "Sulky" by Jean Chevolleau is shown above. 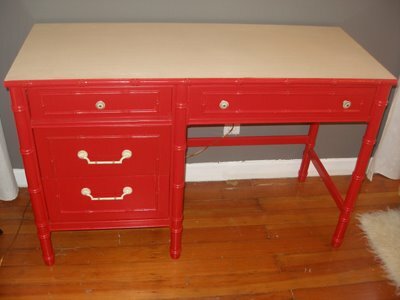 Available through Dragonette Limited. Bambooserie chairs, circa 1960 above, have a grass-green lacquered finish with silk upholstered seats. Available through Fat Chance. 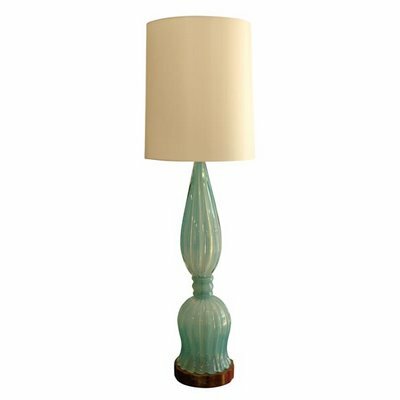 The exquisite hand-blown, ribbed opalescent glass lamp shown above is Italian 1950's, Barovier & Toso by A. Seguso. Available through Emmerson Troop Inc. 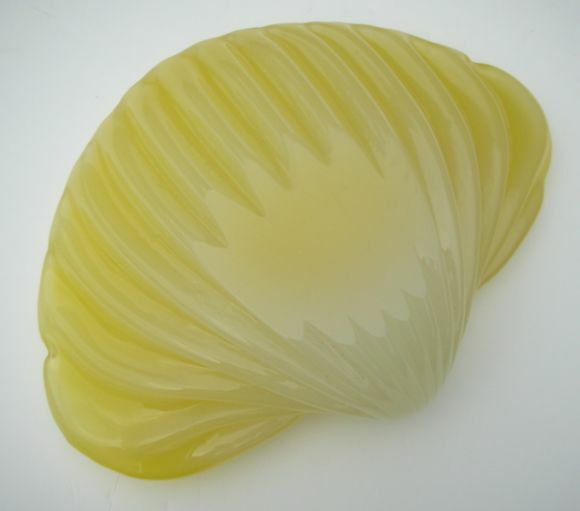 Shown above and below, a large Italian circa 1950 alabastro bowl in a scallop shell-form of white and yellow opalino glass. Available through epoca. 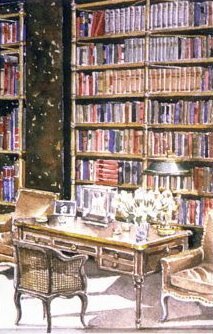 The watercolor above, painted by decorator Mark Hampton, is an illustration of the famous brown lacquered library designed by Billy Baldwin for Cole Porter. 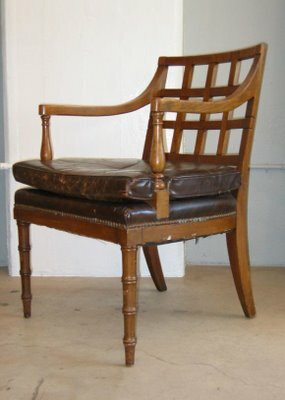 Baldwin mixed dark walls, created to look like tortoiseshell, with brass bookcases and fawn-colored leather upholstery. Totally chic then and now. 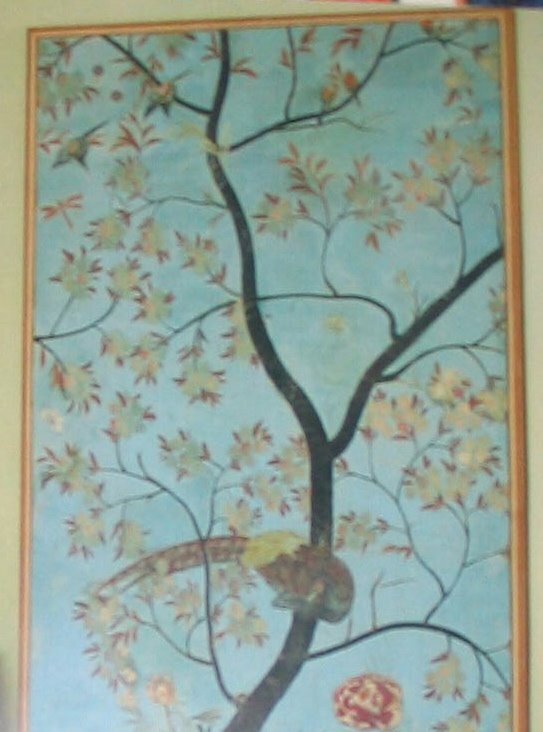 This watercolor is actually one of 22 included in Hampton's 1992 book, Legendary Decorators of the Twentieth Century. Other decorators highlighted include David Hicks, Elsie de Wolfe, Sister Parish, and Jean-Michel Frank. The whimsical red and gilt Chinoiserie chandelier above is another 1950's European find from Ellen Ward Scarborough Antiques. 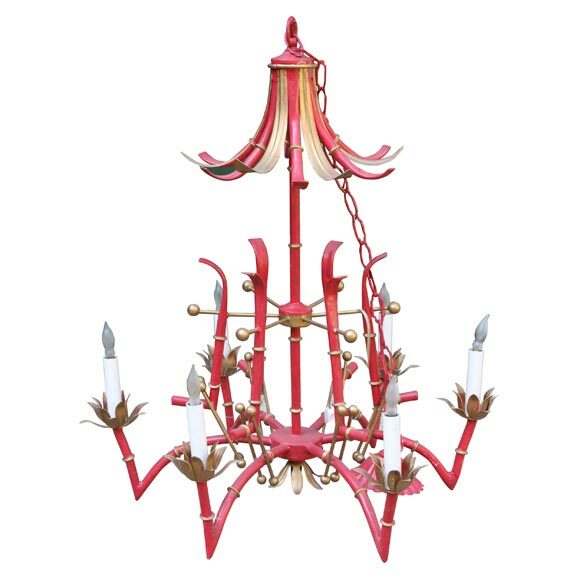 Made in Italy, it's a pagoda style piece done in metal that definitely has a fun Tony Duquette quality. But not totally over-the-top. 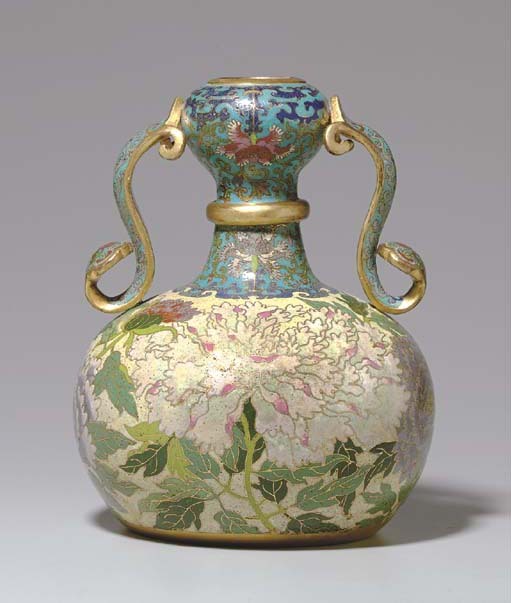 BTW: The Victoria and Albert Museum has a nice online Chinoiserie style guide. 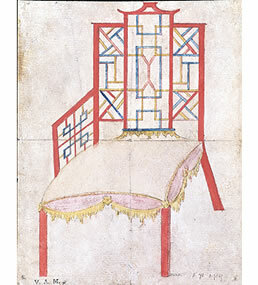 Below is an illustration, included in the V & A guide, of a design for a chair by 18th-century furniture makers William and John Linnell. Christie's Asia Week in New York begins September 19 with a sale of Chinese ceramics and art. 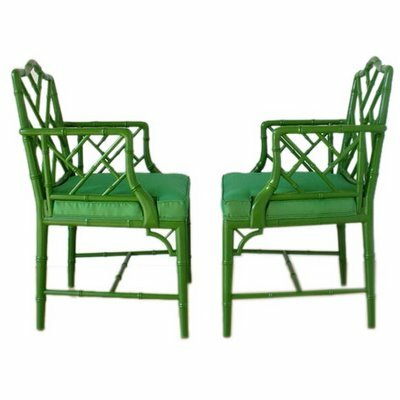 Happily, the online auction catalog -- featuring 450 items included in the sale -- is free and easy to browse for design inspiration. It's page after page of lush color and elegant forms. 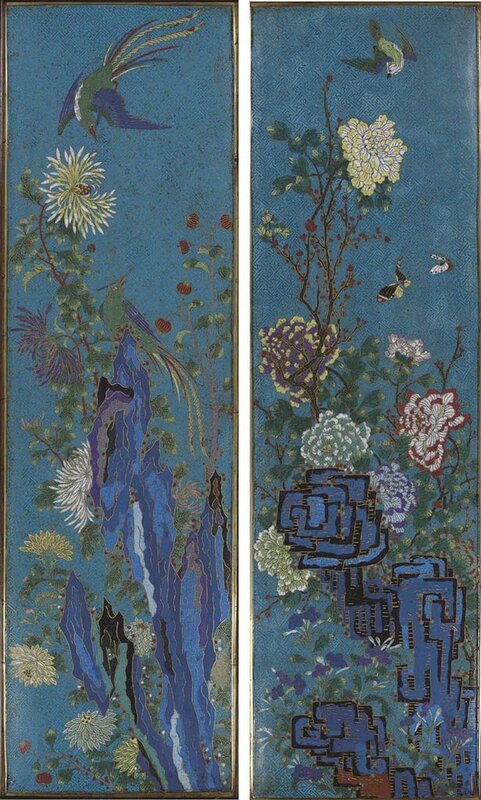 Pictured top to bottom: A pair of cloisonne enamel wall plaques decorated with chrysanthemums, rocks, birds, peonies and butterflies, late 18th/19th century; A small iron-red reverse-decorated moonflask, Kangxi Period (1662-1722) ; A cloisonne enamel globular vase decorated with leafy stems of peonies, early 18th century. 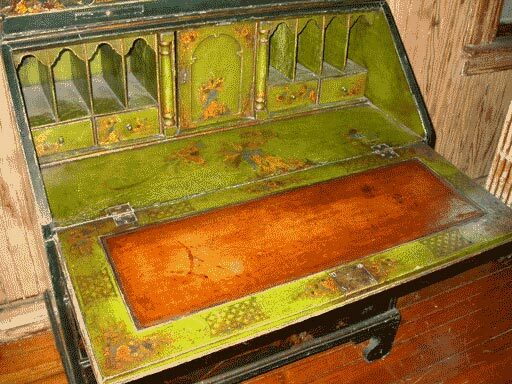 The antique English secretary below is not included in next week's auction. 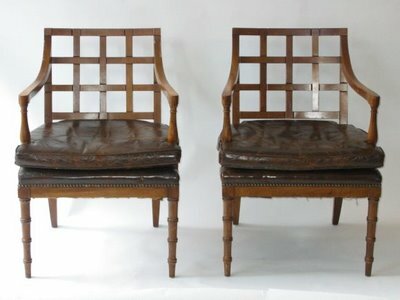 It's something fun I found while browsing 1st dibs. The paint is original but unexpected in different shades of green and amber, and the motif is Chinese inspired. 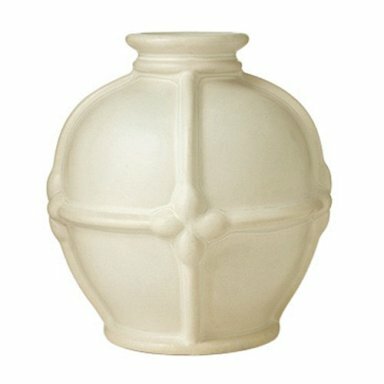 Wouldn't this piece be an amazing focal point in a room? 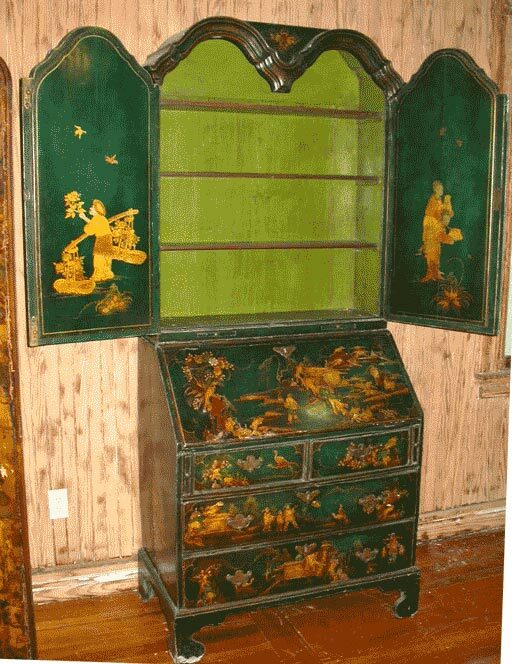 Clearly the appraiser also believes the secretary is rare because the price is $85,000. Originally, this pair of petite green lacquered elephant consoles, shown above top, may have been intended for an adult space decorated in 1970's Palm Beach style. But I can't help thinking the set could be so inviting, yet unexpected, in a child's room. 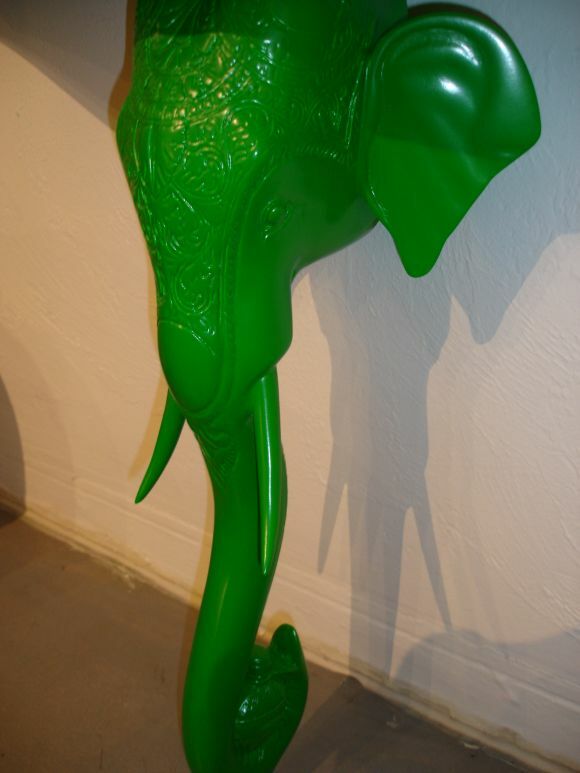 Personally I love the emerald green color, as well as the intricate Indian-like detailing on the elephant's head. Available through Robert Massello Antiques. 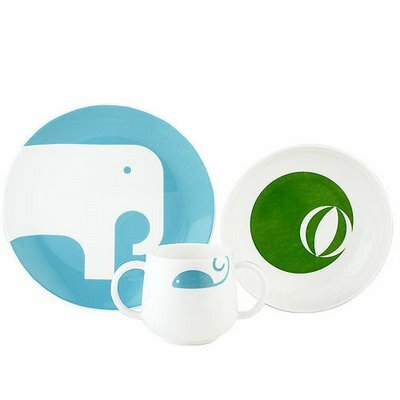 Also shown above, Kate Spade's Pippin Park 3-piece, bone china feeding set. 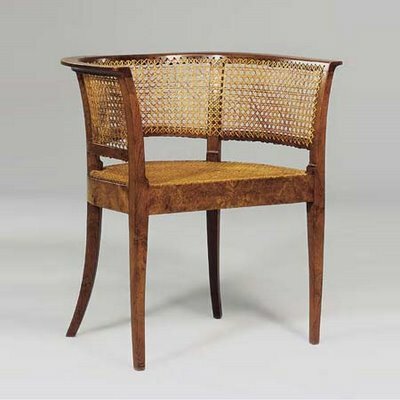 If you are a design student just beginning to learn about the history of furniture, Kaare Klint is a great name to Google. 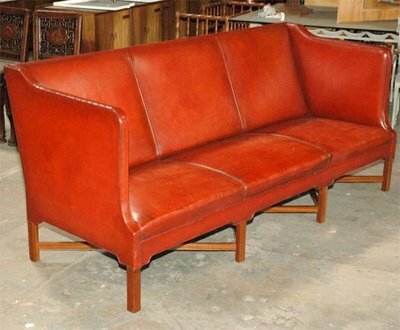 Danish designer Klint (1888-1954) was drawn to neoclassical styles and he created very clean-lined, modernized pieces inspired by historical forms. His goal was always to rethink, not reproduce, classic designs. Most design historians say Klint paved the way for the Danish Modern movement of the mid-20th-century. Klint's chair above, inspired by British Regency models, is known as the Faaborg chair because it was designed in 1914 for Denmark's Faaborg Museum. 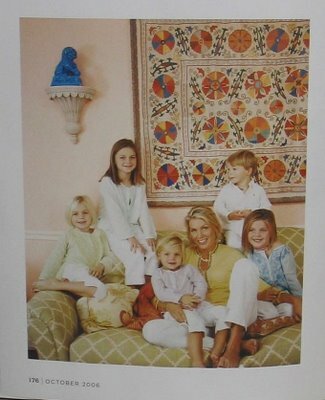 Image is from a 2003 Christie's auction catalog. The leather sofa with X-base is another iconic Klint design reminiscent of English 18th century furniture, and is currently for sale through J.F. Chen. 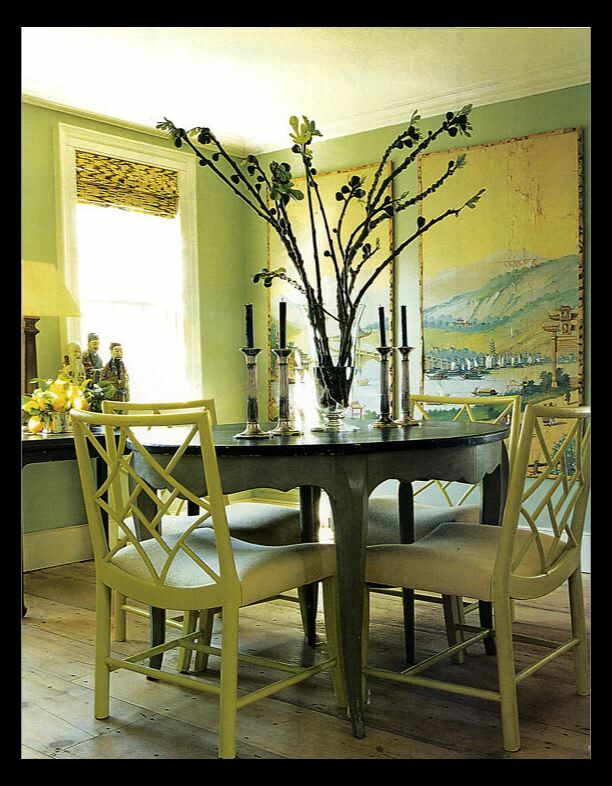 Using a pair of framed wallpaper panels in a dining room can be an inspired and practical alternative to papering an entire room. It's an obvious solution if you rent, or expect to move often, and it allows you to use wallpaper that might be too expensive in large quantities. 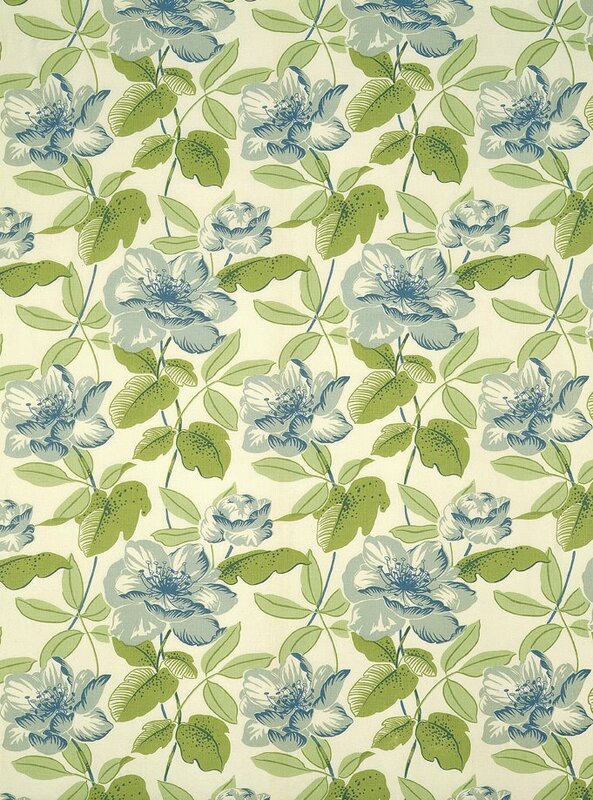 Moreover, this approach can be just as timeless and sophisticated as a completely papered room. Not second choice decorating. 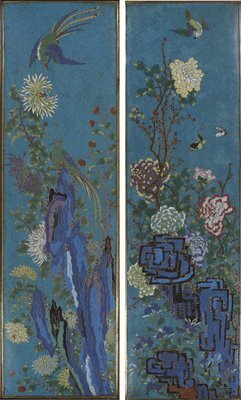 The first image above is a detail view of heirloom Chinese wallpaper that decorator Suzanne Rheinstein salvaged and framed. Originally the paper was used in the childhood home of her husband. The second image is of a dining room designed by Steven Gambrel, using rescued hand-painted gauche panels. 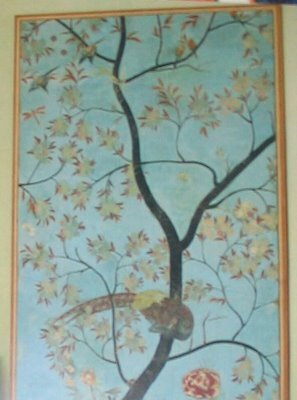 I think the scale of the panels is perfect in this room, and a good guideline if you opt to frame wallpaper fragments or hang any other similar found objects.